One of our most popular Sweet Gum trees, Liquidambar styraciflua 'Worplesdon' has fantastic star-shaped foliage that is more deeply lobed than some other varieties. The glossy green foliage will delight with a display of autumn colour that begins with yellow and orange, developing to vibrant claret red. Corky, fissured bark creates yet more interest and is ideal for children to create bark rubbings. This pyramidal tree will grow to 10 x 6 metres in 20 years when given a moist or damp soil in full sun where possible. 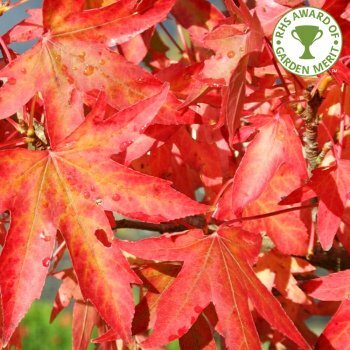 'Worplesdon' is one of the very best ornamental trees for autumn colour in our opinion and has received the RHS Award of Garden Merit. Our pot grown Worplesdon Sweet Gum trees can be planted at any time of the year. Begin by removing weeds and grass within a metre of your desired planting hole, then dig a square hole as deep as your root mass and approximately 2x as wide. We advise sprinkling root grow in the hole to help it establish. Gently loosen the roots and place into the planting hole. Mix 50% of the original soil with 50% high quality compost, fill in the hole and firm around gently. Avoid banking the soil up around the collar of the tree as this can cause problems. Use a stake and tie to help anchor the roots - instructions are in the full planting guide. If you’re planting Worplesdon Sweet Gum in spring or summer, water well and regularly for the first few months. Keep an eye on it and increase watering if there are extended periods of hot or dry weather. If you’re planting in autumn, you may only need to water a little. Consider using an irrigation kit to make it easier. Once planted, keep the area free of competing weeds and grass for the first few growing seasons - mulch matting will aid this. Do not simply mow the grass around the area as this will only encourage it to grow more vigorously. If your area is prone to rabbits, use a rabbit guard to protect the trunk. Tip: if you are mowing grass near a Sweet Gum tree, it is best to remove any seedballs first as they can cause a problem for lawnmower blades. Worplesdon Sweet Gum trees do not require regular pruning, but you can trim them if they look a little untidy. The ideal structure is for one central leader, so if you see any competing branches, remove the weakest along with any suckers. The best time of year to prune a Sweet Gum tree is January or February.